Image Size: 45 X 23 in. You are witness to something few humans ever see. The sweet smell of incense carried on the breeze has awoken you from your rest in the woods and you capture a glimpse of the king and queen of the faeries passing by. "This is not the May Day parade or a Coronation," James C. Christensen explains. 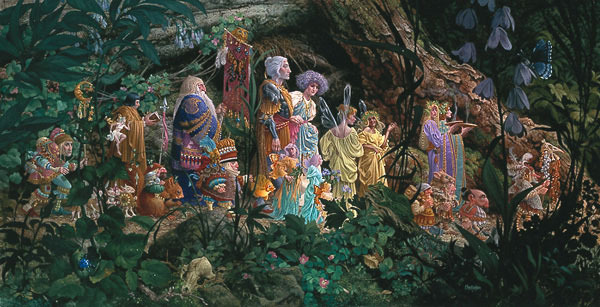 "Simply, this is The Royal Processional - just your regular, everyday king and queen of the Faeries entourage." Inspired by the grand processions of history, fiction and movies, Christensen provides a glimpse of the faerie world by fashioning an eclectic parade of fantasy forest denizens. "The king in the armor is Oberon and the queen is Tatiana," says Christensen. "They are the rulers of the Faeries. Other fascinating creatures waiting to be discovered are their laughing faeries-in-waiting, their old prime minister with the butterfly banner, the young wizard-in-training with his nose in a book, and the incense bearers to alert - by smell - the other forest creatures."